Bayern Munich's South Korean teenage prospect Jeong Woo-yeong has made his first-team debut in the top European club football tournament. 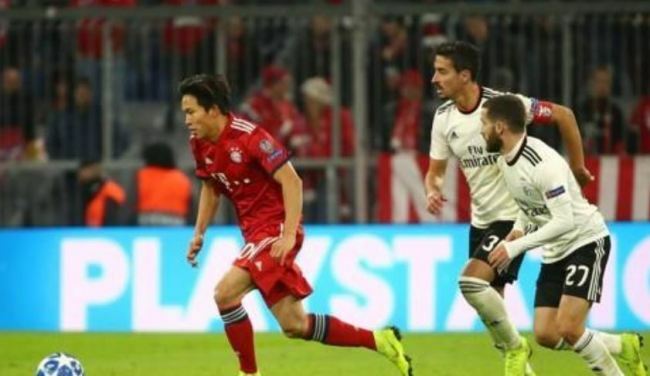 Jeong played in Bayern's 5-1 win over Benfica in a Group E match in the UEFA Champions League at Allianz Arena in Munich, Germany, on Tuesday (local time). The 19-year-old midfielder entered the pitch in the 81st minute for Thomas Muller and became the first South Korean to make a debut for the German Bundesliga giants. Although he failed to bag a goal or an assist in his debut match, Jeong also became the youngest South Korean to play in the UEFA Champions League. Jeong is the ninth South Korean to compete in the UEFA Champions League but is the only one who made his first appearance before age 20. Tottenham Hotspur star Son Heung-min made his UEFA Champions League debut at age 21 when he was with Bayer Leverkusen in 2013. Jeong, who mainly play as a winger, joined Bayern in January after signing a contract that runs through June 2022. He then went on to play for the U-19 squad and the reserve team at Bayern. Jeong first made Bayern's first-team roster last month for the club's German Cup match against SV Rodinghausen. He also made the Bayern bench last weekend in a Bundesliga match against Fortuna Dusseldorf but failed to appear on the pitch.